Raisin Sauce. 2 tlbsp fat thicken with flour. about 2 tlbspoon Plump 1/2 cup raisins about 10 min. 1/2 cup pineapple juice + sherry wine to taste. 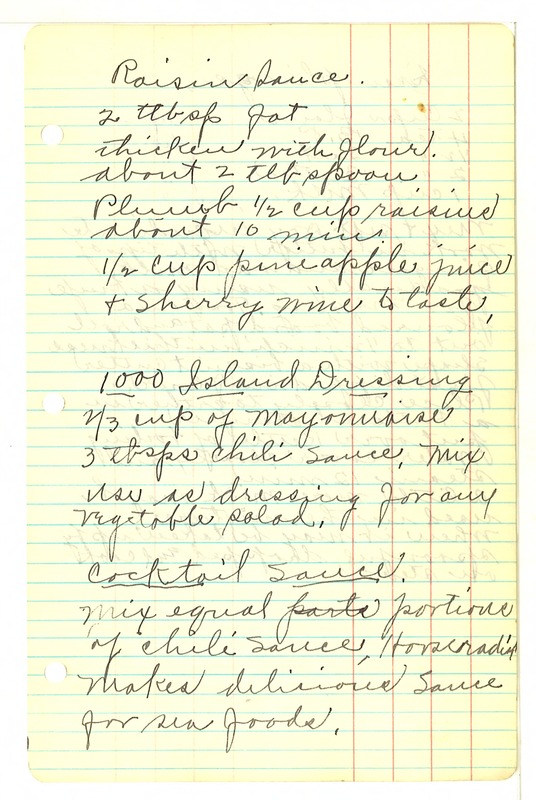 1000 Island Dressing 2/3 cup of mayonnaise 3 tbsps chili sauce. Mix use as dressing for any vegetable salad. Cocktail Sauce Mix equal portions of chili sauce, Horseradish Makes delicious Sauce for sea foods.